I recently had a chance to talk to Ron Hyde, Enterprise Technologist from Dell. Ron has a strong background in mobile management and security, and I got his perspective on what SMBs need to be thinking about as they mobilize their businesses. If you’d like to listen to the recorded podcast, click the link below. Laurie: Ron, the SMB Group recently completed our 2012 SMB Mobile Solutions Study, a survey of 750 SMBs, to find out about how they’re using mobile solutions in their businesses. We found that while SMBs are increasingly taking advantage of mobile solutions to help improve productivity and better serve customers, many of them don’t have a program or tools in place to manage and secure these mobile apps. What are you hearing from Dell SMB customers about how they are using mobile solutions, and what are the challenges they face in managing them? Ron: That’s a great question. Our SMB customers are embracing the consumerization of IT devices. Put simply what that means is that employees are bringing in their own personal devices, such as iPads, tablets and such into the workplace. It’s simply good business. They want to bring these devices into the mix because they help their employees communicate, collaborate and get the job done. But at the same time it adds a layer of complexity for IT to manage. There is a new social attitude, which accounts for the most significant drivers for adoption of a mobility strategy. Some examples are flexible working arrangements, where companies wish to hire and retain key talent, and by embracing remote working and smartphone technologies companies appear more attractive. This helps retain key talent and provides a differentiator when hiring new people. Work-life balance is another, to help reduce commuting time, increase productivity, improves the work-life balance of employees, and lets employees access data anytime, anywhere. Environmental impact, which we’re all aware of, to reduce the amount of physical infrastructure, and reduce commuting for employees by having them work at home. All of this creates a layer of complexity that IT needs to address. Laurie: Right, we’re seeing the same thing. Especially in smaller businesses, the “bring your own device” to work scenario is a very frequent choice. But, while its nice to let employees use what they want, you’ve got to manage all of the variations. In the study we did, we found many SMBs already provide mobile access for productivity and collaboration apps–email, calendars, contacts, etc. So this is already mainstream among SMBs. 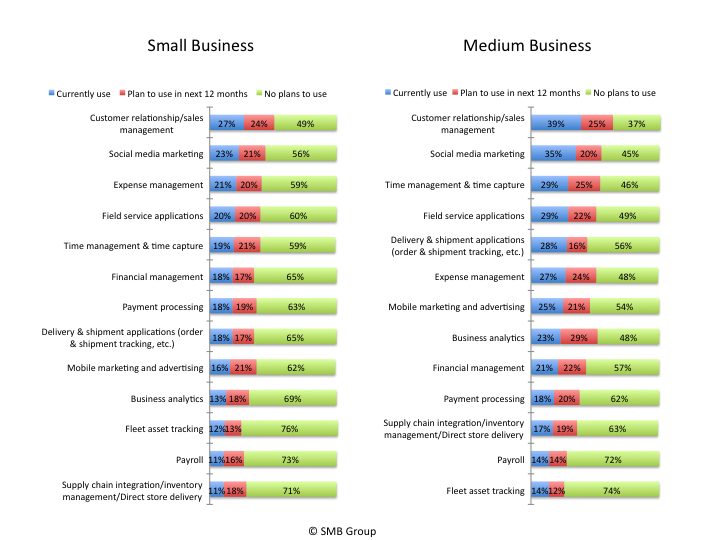 The next thing SMBs are looking to mobilize are business applications–things like CRM, social media marketing, time management, expense management, and field service for their employees (Figure 1). Do different considerations come into play as companies mobilize business apps as opposed to personal productivity apps? Ron: Absolutely. There are several areas customers need to focus on when providing mobile business applications to their employees. Let’s look at several of the top considerations. First of all, security for the mobile application is a major concern. The ability to implement policies on your mobile workforce devices is critical to protecting precious business data. These are the keys to the kingdom, regardless of company size. When I refer to a policy, I’m referring a written procedure within the company that gives guidance to employees on the use of those devices, as well as a policy for how those devices are secured for use in the mobile workforce. Also, one of the hazards of a mobile workforce is the risk of employees losing the device. Having the ability to remotely locate and wipe that device should not be looked at as a ‘nice to have’ but an absolute requirement. Another thing to look at is effectively managing mobile devices within the environment. It all starts with keeping an accurate inventory of the devices connected to the environment. Also, making sure those devices have an unlock code installed, and if not, some type of automation to put a lock code onto the devices to prevent them from being used by an unauthorized person. Finally, the ability to prevent ‘unapproved’ software from being installed on the devices connected to the business. The other thing to consider is expense management for telecom. This is sometimes overlooked, but can easily become a large, variable expense based on employee’s usage, roaming charges, having multiple devices, relying on different carriers or international travel. Laurie: Yes, we found in our study that the biggest obstacle to mobilizing employees is the cost of voice and data services. There are a lot of companies, especially with bring your own device–and bring your own service–that are not really taking advantage of any type of volume discounts or shared pooling or anything like that. Ron, these are a lot of things to manage and take care of. And as you know, most SMBs don’t have a lot people. So how can they realistically get all of this done? Ron: You know, it seems like an overwhelming task to take on. But it is critical to embrace a mobility strategy. Don’t feel like you’re alone–Dell can provide guidance and strategy to manage mobility, and affordable solutions for any size environment. Laurie: The other big area I wanted to touch on is that in addition to asking SMBs about how they’re mobilizing their employees, we asked them about what they’re doing to provide customer-facing apps and mobile-friendly web sites. We found that in many cases, SMB use and plans for customer-facing mobile apps are even more aggressive than for employee apps. SMBs want to use these apps to grow their businesses, and give their customers ways to use mobile devices to research, shop and buy their products and services. 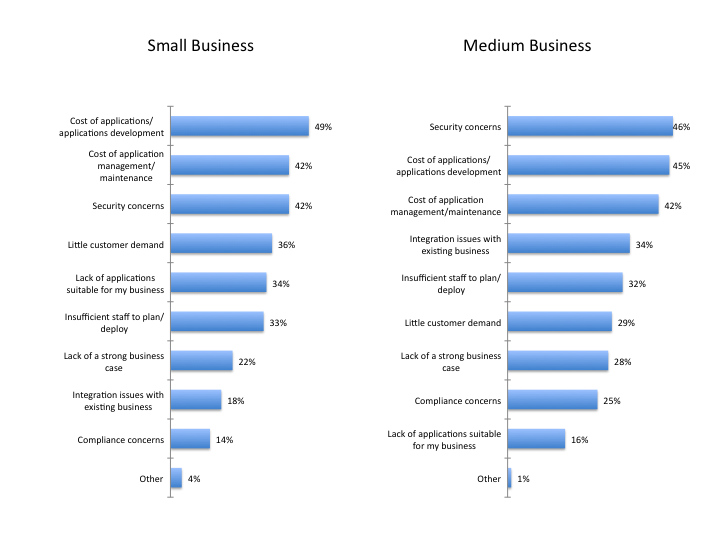 So what kinds of management and security precautions should SMBs be putting in place for customer-facing apps? Ron: So let’s take security first. Nothing will damage a company’s reputation or their ability to conduct business faster than a security incident. So SMBs and their customers need to ensure they do not expose their customer data or customers to undue risk. Do not overlook the fact that sensitive data can be stored or shared on Wi-Fi networks or even on mobile devices. For instance, you can be at Starbucks or at the airport, and see an open hotspot labeled free Wi-Fi. Make sure you are connecting to their Wi-Fi. There are a lot of open Wi-Fi connections but many can be rouge hotspots specifically set up to harvest data and use it for nefarious reasons. Keep a keen eye on authentication and encryption between the mobile device and the source. Application functionality and the end-user experience is another thing to think about. Make sure the apps function correctly, regardless of the device, and take into consideration how the devices and apps are connecting, meaning is it on W-Fi, or a 3G connection or whatever. Make sure it behaves as expected. Laurie: Again, this is important. But what services exist to help smaller companies do this? Ron: Dell can help with this, when you’re starting the journey of developing your own mobile apps. Again, you don’t need to go it alone. Laurie: Okay, you wanted to touch on that end-user experience. Are there ways the SMB can monitor and see if there are problems? Ron: Yes, there are best practices, and they are available on the Dell Tech Center web site as well as other technical sites. Laurie: Of course they can also buy off-the-shelf mobile apps from their application vendors. So for instance if they’re using business solutions from Intuit, or Sage or SAP or whomever, they provide out-of-the-box mobile apps for SMBs that don’t want to develop their own. Ron: Absolutely. Also the apps stores, for Apple iPhone and Google Android, they are commercial off-the-shelf that have already been tested. Laurie: Might be the best option for a lot of the small companies! Just to wrap up, based on our study, there’s no doubt in my mind that SMBs are looking to mobile solutions to boost productivity and help them grow their businesses. As their reliance on mobile solutions grows, what can Dell provide to help them manage their mobile solutions and ensure that they’re secure? Ron: We have several mobility management offerings that SMBs can use to balance the need for access and productivity against the need to maintain the integrity and security of their resources. For example, Dell’s Mobile Device Management solution can automate and streamline the deployment and management of or SMB customer’s mobile devices and middleware infrastructure, regardless of the device OS. The solution provides real-time monitoring and management of mobile voice, data, and messaging as well as a central management console for security and application control. Laurie: Where can SMBs go to learn more? Laurie: Ron, it was great to talk to you today. Thanks so much for your time, and for joining us to share your knowledge and perspectives. Next Next post: SMB Tech Tidbits: Focus on Social Collaboration!